At the eleventh hour of the eleventh day of the eleventh month - Nov. 11, 1918 - the Armistice was signed that ended the Great War in Europe. Almost two years earlier the United States had declared war against Germany and set sail to join the already-fighting British in France. American forces sailed off across the Atlantic to rousing choruses of George M. Cohen's latest Tin-Pan Alley hit, "Over there! Over there! Send the word, send the word over there that the Yanks are comin'! the Yanks are comin'." Those Yanks were from Maine to California as well as from the remotest regions of the Territory of Alaska! Once arrived in Europe, they jolted across the French countryside in careening trucks and marched to the front lines to join in the bloody trench warfare against the German Kaiser. Alaskans had immediately responded to America's call to arms in the spring of 1917. Miners laid down their picks, fishermen assigned beardless youths to skipper their boats, and Alaska's all these volunteers paid their own way to Seattle to enlist. So many Alaskans had volunteered that the 1917 national draft of 21 - 31-year-olds became unnecessary in the Territory! The Great War of 1914-1918 was a vicious and bloody "modern" war not only of foot soldiers but of heavy tracked vehicles as well as fragile aircraft. Aviation aces used their wood-and-fabric biplanes to bomb enemy positions and engage in the world's first aerial dogfights with German aviation aces. The enemy on the ground employed poison gas that seeped, barely visible, across the mud of smoky and pitted battlefields and into the lungs of the men who fought to gain and claim mere yards of enemy territory. It was trench warfare, fought not only with bullets but with hand-to-hand bayonet combat. Wet and mud-coated Yanks and Brits stormed out of the comparative safety of their grave-depth trenches to charge across foreign soil, against a foreign enemy. And they finally charged to victory. The Armistice signaled the end of this deadly conflict that was different from any other fought before by American troops. When Germany's Kaiser was finally licked, the United States would mourn the deaths of 117,000 American boys and would face caring for those 204,000 men wounded or gassed in the conflict. At its end, the war was optimistically called The War to End All Wars, and, not until World War II (1941 - 1945), would the doughboys' war be dubbed World War I. The Doughboys returned to the States sobered and scarred by memories of the war's carnage, yet cocky and celebrating in victory. The Tin-Pan Alley hit song "How you gonna keep 'em down on the farm, after they've seen Par-ee!" burst across the nation via sheet music and wax phonograph records. The young veterans' boots tapped to music as they reveled in wine, women and song before they boarded troop trains en route back to the farm, the mine, or the sea. There was a war-long fear among a good number Americans parents and politicians that "the boys" ­ as they had dubbed themselves - would come home from Europe with French postcards, or a little mademoiselle on their arm, or ­ worst of all - a taste for French wine. And there followed a rush get the Volstead Act into effect, the Prohibition law that America faced less than a year later, on Jan. 20, 1920 (except in Alaska, which had "gone dry" on Jan.1, 1917). 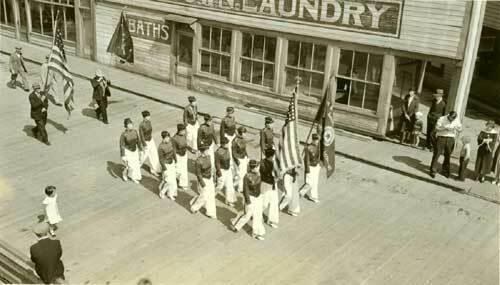 By the spring of 1919, the young vets from Ketchikan were beginning to trickle back into the old hometown. As each ship cleared Mountain Point, the boys must have been on deck, ready to race down the gangplank. In spite of ugly wartime memories, Deer Mountain would have looked just the same! So would the fire hall's weathered hose tower, and the landmark cupolas of the Revilla and Stedman Hotels. The spruce mill saws whirred and screeched as the boys smelled the scent of spruce sawdust as well as fish offal from the dockside canneries. It smelled just like home! The veterans were not the same young men who left to become soldiers. They had seen things in war that had tempered them, aged them, things forever etched in their memories that changed their whole outlook on life. There were things they couldn't mention in casual conversation, and so the veterans sought out each other for comradeship. In fact, "comrade" was the word they used for their fellow veterans, a word that hadn't yet been given its altered, 20th century Soviet spin. The Alaska boys heard of a group of American veterans who, while still in France, came up with the idea of a legion of vets with common interests and goals. An initial meeting had been held in St. Louis, Missouri, where a Legion constitution and by-laws were presented. 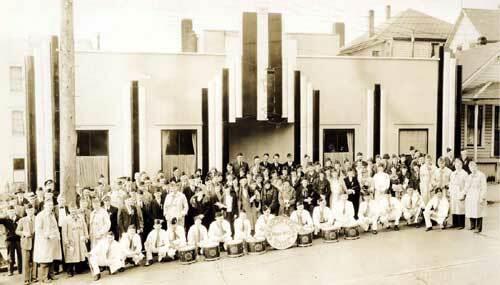 It was May 1919 and it was the founding of the American Legion. Individual hometown posts from across the nation would form their own units and eventually become united with national headquarters. In towns across America veterans were seeing life from a different perspective from the pre-war direction of their lives. It was one of dedicated, continued service to their nation and individual communities. 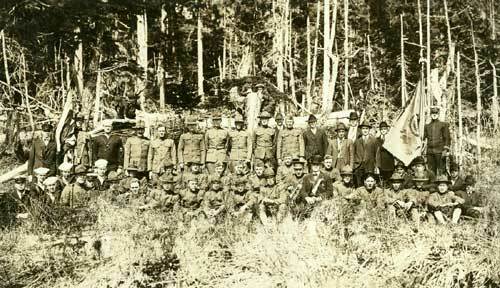 In Ketchikan in July 1919, a band of veterans joined into a group they called the Sons of Democracy. Amazingly, in the little town of only 2,400 souls, it was estimated that 150 vets eventually returned to Ketchikan! There were 72 veterans of the Great War who initially signed up for Sons of Democracy membership. A.H. Ziegler was elected first president and C.J. Collins was chosen for secretary. Serving with them were the new post's first officers Jack A. Talbot, commander; Eldon J. Daly, vice-commander; Robert B. Spaeth, treasurer, and Norman R. (Doc) Walker, employment officer. In 1921 the post would add a historian to its roster of officers. Emery Tobin, then a bookkeeper for New England Fish Co. was elected to that office. When the Ketchikan post decided to join the national American Legion the following year, the 72-member roster had already grown to 117 members! The preamble to their constitution begin with "To uphold and defend the Constitution of the United States," followed by "to maintain law and order, to foster and perpetuate 100% Americanism, and to preserve the memories and incidents of our association in the Great War." The fifth responsibility listed was perhaps the one that certainly has defined Ketchikan Post #3 over the past 85 years: "To inculcate a sense of individual obligation to the community, state and nation" - an obligation that Post 3 fulfilled many times over. 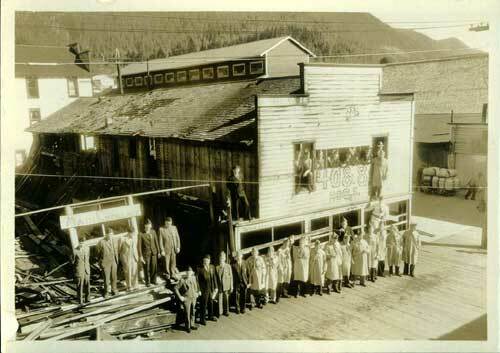 The very active and newly-formed post back in 1920 met first in the Pioneers Hall on the hill behind the Gilmore Hotel; and then in the rooms above Ryus Drug, located in the now-gone commercial building on the dock side of Front between Dock and Mission, and then in the Moose Lodge rooms above the old Electrical Laundry on Water Street. Soon the boys would be able to build their own "dugout" on the tidal flats at the mouth of Ketchikan Creek. After convincing the people of Ketchikan that their Legion was not a "military organization" in any way, the post set about fund raising. Quoting from the Legion history: "The boys rallied around that old war spirit, put on an Armistice dance and a series of smokers (boxing matches) which netted the post a nice little nest egg. Several stag parties were held throughout the year, which brings to mind the time Casey Williams went through the paddle wheel at the old Hippodrome building." The Legion history hints there and elsewhere that some of the boys did indeed bring back a taste for French wine or whatever, a taste that sent said Casey crashing through the gambling wheel at the Hippodrome - a combination roller rink and movie house at the foot of Main Street. One of Legion Post #3's earliest efforts was initiating Ketchikan's annual ceremonies and marches on Decoration Day, May 30, and on Armistice Day of Nov. 11. Those occasions, dedicated to the nation's service men and women as well as the fallen warriors of every war are still Legion- and VFW-sponsored today, but the holidays are now called Memorial Day on May 30 and Veterans' Day on Nov. 11. Post #3 also sponsored the annual Fourth of July parade and other events in those early years of Ketchikan rollicking Independence Day celebrations. In 1923 the Legion assisted in the organization of the Ketchikan visit during the first-ever Presidential tour of the Territory of Alaska. President Warren G. Harding visited the First City in early July and laid the cornerstone of the Masonic Temple on Main Street, the location today of the State Office Building. Three Ketchikan streets were named in his honor: Warren, G., and Harding Streets. Post commander Ed Elliott later made good use of the political contacts made that day to request a U.S. Executive Order to gain use of tideland property at Stedman and Mission Streets, location of today's Federal Building. The Executive Order was later granted. The property was used for the construction of the post's first dugout. 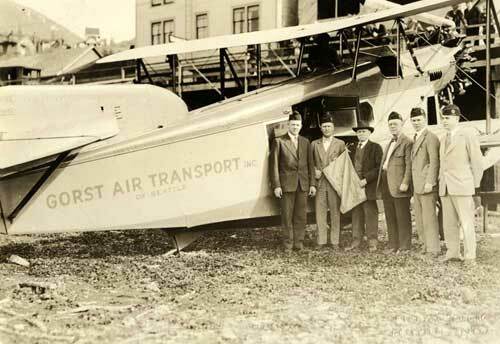 It was also in 1923 that the Post promoted the town's Boy Scout Troop #1, not only the first Scout troop in Ketchikan but the very first in all of Alaska! The troop is still active today. It was 1924 that Post #3 learned that burial space at Bayview Cemetery was becoming limited. The town's graveyard was cared for by various volunteer organizations ­ including the Legion - back then. The cemetery property, on a low slope of Deer Mountain, had been opened for use back in 1911, but the original patch of deep topsoil was limited. In 1924 the Legion superintended the blasting of rock that was removed and replaced with topsoil hauled in from elsewhere. That's a cemetery practice that continues periodically to this day. That was also the year that post members T.C. Eastman and Ralph A. Bartholomew were in charge of importing mountain ash trees from Wrangell to be planted at the cemetery - and elsewhere around town. The two Legionnaires also oversaw the raising of a cemetery flagpole. In 1928 comrade Joe Kehoe superintended the Legion Post's largest, and longest, project ever. With permission from individual Tlingit family owners, totem poles in abandoned Tlingit villages south of Revilla Island were rescued, ferried to town, refurbished with Tlingit oversight, and placed in various locations around the city. This project merits a separate story of it own one day. The American Legion Post #3 has accomplished so many feats and spearheaded so many activities over the years - from stage plays to memorable ball games to community events - that it would take an entire book to list them all! The Legion's membership and activities, like those of any organization, fluctuates from year to year. But meetings are still held regularly at the "new" c. 1938 log cabin dugout at the corner of Bawden and Park Avenue. The Legion could now use some help. It sponsors the statewide oratorical contest with students from Ketchikan High School, in which young people debate a point in the Bill of Rights. Since teacher John Cote is no longer available, no one at the high school has taken up the reins to find and encourage talented students to enter. This year there were no boy applicants from the high school for Boys State. Anyone who would volunteer to correct this situation may contact Jim Van Horn or any Legion member. It's time to support Legion efforts just as the Legion has supported so many other community efforts in its 85 years of existence.